Pupils from Leith Walk and Broughton Primary School attended a day of Show Racism the Red Card Activities at Hibernian Football Club. Pupils from Leith Walk and Broughton Primary School attended a day of Show Racism the Red Card Activities at Hibernian Football Club. The day was designed to promote messages of equality and respect, allowing the young people to explore their views and knowledge about racism in a safe environment. 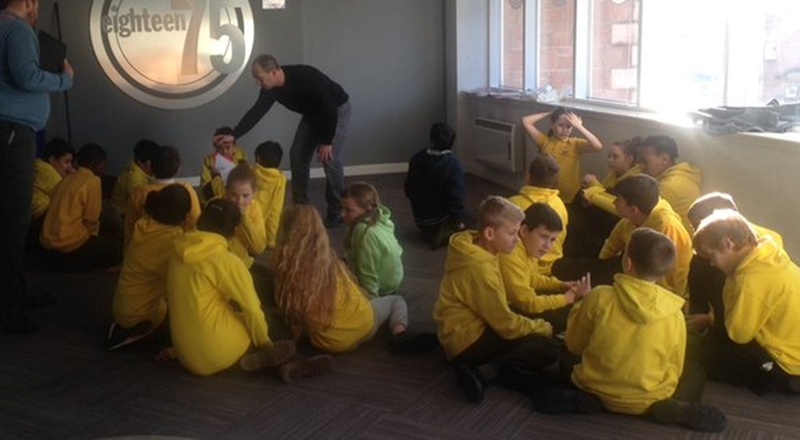 The young people took part in a workshop in the morning exploring the meaning of racism and the consequences of stereotyping. This was followed by a stadium tour with staff from Hibernian FC. In the afternoon the young people were joined by Hibs player Adam Eckersley. The young people got the opportunity to act as journalists and participate in a “press conference” with the panel, where ex-professionals and Show Racism the Red Card coaches, Derek Ferguson and Michael Weir joined Adam to answer questions about racism and experiences. The young journalists asked some tough questions about the best ways to tackle racism but the panel did a great job of promoting the message that we all have a role to play in challenging racism. Thank you to Hibernian Football Club for allowing us to host a wonderful event at your stadium and a big thanks to Leith Walk Primary School and Broughton Primary School for attending this anti racism event, we hope you had an amazing time.